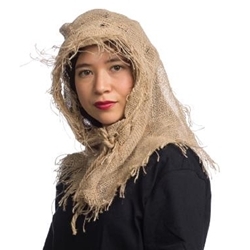 The Burlap Cowl is a tattered hood available in adult one size fits most. This accessory is excellent for a scarecrow or horror Halloween costume. Complete a scarecrow look Scarecrow Straw, or finish your horror costume with a mask and robe!